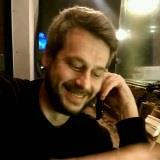 If I had to go back to business school again– which I’m definitively done with! 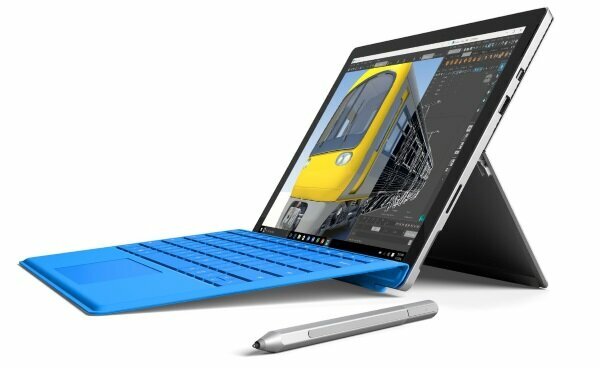 – the Microsoft Surface Pro 4 would be my #1 choice. Beautiful, portable, versatile and well-built, the Microsoft Surface Pro 4 is a little marvel of engineering. While the design has been copied since, it’s still the leader of 2-in-1 laptops. It’s near perfect in both laptop and tablet modes which makes it one of the most versatile laptop you can purchase. Microsoft really built a high quality, versatile product here. When used in tablet mode, you get a full-featured tablet running Windows with which you can draw or write naturally thanks to the 1024 pressure level pen. Connect the keyboard / cover and you get a laptop equipped with high-end equipment that ensure performance, great sound and one of the best screen on the market. Really a great product by Microsoft. When first launched, the Microsoft Surface was unique in its kind. While it’s been copied since, they have improved on the original design with every version. So much that there is now very few flaws in the design. You can feel the build quality when you hold the tablet in your hands and can see that it is strong and durable. It looks – and is – premium and the design is classy and simple. And at 0.33 inches thick and only 1.73 pounds, just put it in your bag and forget it’s there. The Microsoft Surface Pro 4 can be configured with 3 different processors: the Intel m3, i5 and i7. The one reviewed here is the i5 with 8GB of RAM since this configuration will be plenty for the great majority of users. With this configuration, you won’t feel any lag, even with heavy-multitasking. Don’t be mistaken by its tablet look, it’s really a full-performing laptop. Simply put: one of the best screens on the market. The 12-inch screen is near perfect with its 2734 x 1824 resolution, vivid color and high brightness. The i5 version comes with a standard HD Graphics 520 card. This card works well for productivity work, but forget about high-end design. If you are a designer or an engineer, choose the i7 version that comes with the Intel Iris graphic card (the same that equips a MacBook Pro). 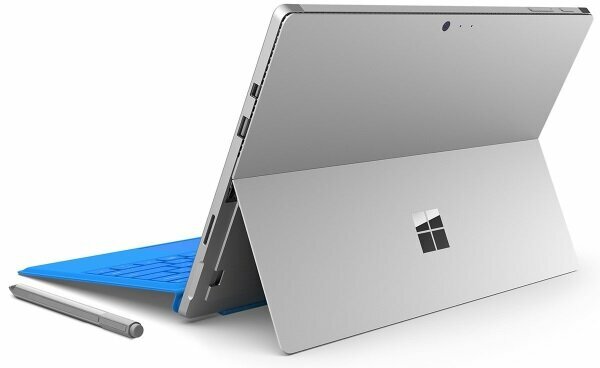 Don’t forget that the keyboard/cover doesn’t come with the Surface, it has to be bought separately. Many hard drive options are available – up to 1 TB – but to get the best value, choose the 256 GB SSD. You also get a USB 3.0 port and a microSD card reader to add more space if needed. No HDMI connector here, instead a mini Display Port. Battery life is maybe the only place where the Microsoft Surface Pro 4 loses points. While it’s not inherently bad at ‘up to’ 9 hours, some competitors do better. Expect it to last short of a full day of work. Sound is loud and clear and, for a laptop/tablet, is one of the best audio you can get. It’s great for watching movies or listening to music while working, but if you are an audiophile, no laptop will satisfy you. You’ll need to plug external speakers. All-in-all, I think the Microsoft Surface Pro 4 speakers sound great. The full-sized keyboard also acts as the tablet cover and Microsoft greatly improved it from the past versions. While it’s not exactly like a ‘real’ laptop keyboard – it feels softer – it’s still very responsive and comfortable to type with. The touchpad is also big and responsive. Don’t forget that Microsoft doesn’t sell the cover with the Surface Pro 4, it has to be bought separately (yes, this is annoying). 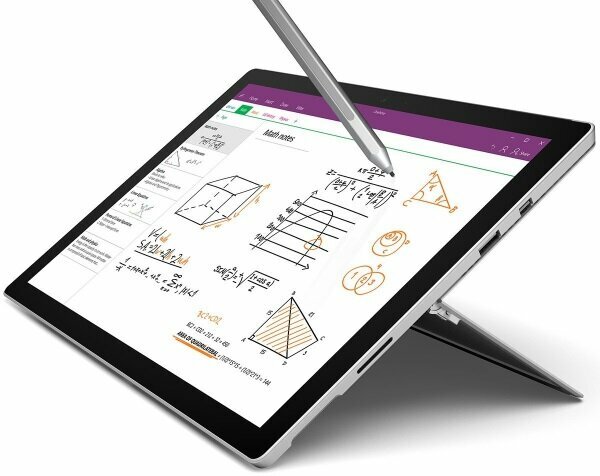 The Microsoft Surface Pro 4 also comes with a pen that makes writing and drawing very natural. It has 1024 level of pressure, meaning that you’ll be drawing very naturally. You can also use it to write and the Surface even can transpose your free hand writing to characters- and it actually works pretty well! High-End Laptops – Our Ultimate Top 40+ Guide! Best laptops under $2000 – High Quality. No Compromise.